YOU BOUGHT THE DRESS NOW WHAT? We excel at adjusting designer wedding dresses. We can also refurbish and adjust once worn gowns and sample dresses. Trust us, we have sent hundreds of happy brides down the aisle in a custom adjusted perfectly fitted wedding dress. At Woven Streams we have experience altering many designer wedding gowns. We have worked with gowns by Oscar de la Renta, Vera Wang, Reem Acra, Jenny Packham and Monique L’Huillier, among others. We personalize your designer dress creating “The Perfect Fit”. We are happy to custom design accessories such as shawls, veils, boleros and belts to go with your designer dress for your wedding day. Ideally we like to meet the bride with her dress and her wedding shoes, 6 weeks before her wedding. At this first consultation/fitting we assess the adjustments required, and provide you with an estimate for the work. Allow up to an hour and a half for our first meeting. 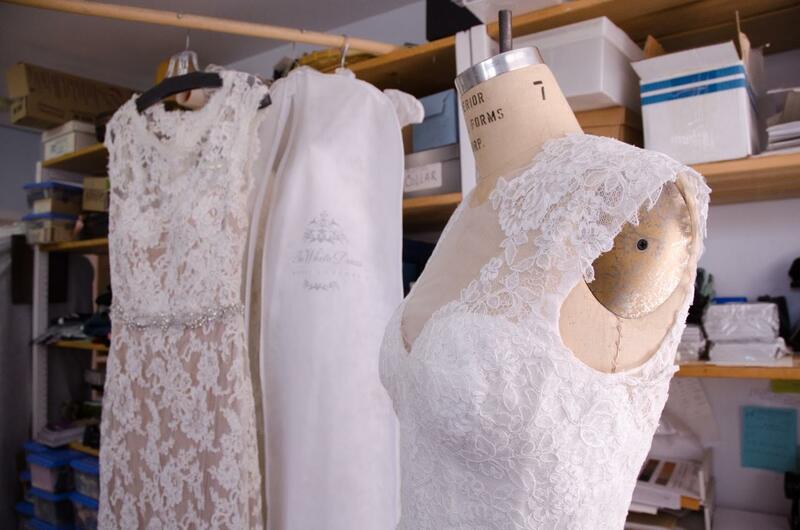 The last fitting should be about 10 days before your wedding where if necessary, small adjustments can still be made. On average adjustments to wedding dresses cost between $350 and $550 when the dress is ordered in the correct size. Included is a fitting fee of $75. The rate for alterations is $45 per hour. For sample dresses or once worn gowns it tends to take more time in the sewing room depending on size adjustments and the amount of refurbishment required. For example, with any wedding gown we often build more structure into the bodice of the gown with cups and extra boning. Yes, it is possible. We would love to make your gown fit just right for you!